Just in time for Easter, yesterday I spotted the first crocuses of spring, blooming along the leaf-littered edge of the same yard where I’d spotted this year’s first snowdrops. What better metaphor of resurrection do you need than the poking of fresh new flowers out of last year’s dead leaves? This afternoon, J and I tackled our own portion of last year’s dead leaves: one last batch of autumn that an early snowfall had left buried on J’s yard for the winter. Raking last year’s leaves from under one of J’s shrubs, I found snowdrops blooming there, too, completely buried in leaves. What sort of faith–what kind of tenacity–inspires a flower to bloom without ever having seen the light of day? Spring in New England feels a bit like that as you move forward toward a season you can’t completely see: “This,” you tell yourself, “is the direction I remember spring as being.” Earlier tonight, our yard-work done, J and I took a sundown stroll and remarked on all the leaf-bags we saw lined in front of neighbors’ houses: on a mild March weekend, everyone’s been out raking and bagging that last batch of hitherto buried autumn. There’s a good deal of faith–a tremendous amount of tenacity–in that endeavor, too: an unspoken hope that if you uncover the cold, winter-blanched earth, the soon-to-be-spring sun will awaken life from the dead. 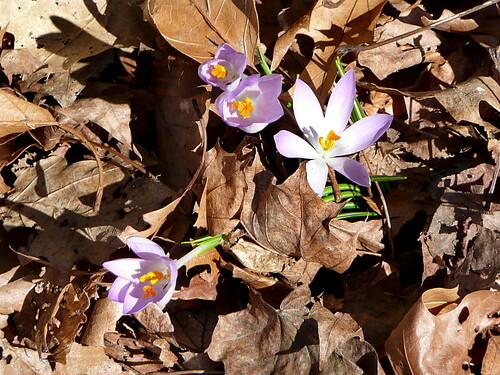 spectacular – the photos of/and the flowers against those dead leaves. not sure which is the metaphor – easter or the flowers/dead leaves. I would lean toward easter being the metaphor. I guess that marks me an agnostic. in any case – spectacular. They are nice flower photos. Tell me, does anyone know/remember why the leaves get raked up? I cannot think up a reason why it is considered a worthwhile activity. Beautiful! Hoping I see some around here this week. But that’s relying upon a technical definition of “metaphor,” and you could argue that my use of that particular word was itself metaphoric (i.e. figurative, not literal). twoblueday, I think the basic idea is “dead leaves = dead grass.” If you want a lawn, you have to keep it from getting choked/shaded by leaf litter. And if you live in a suburban area where your neighbors are concerned about their lawns, being the only house in the neighborhood with unraked leaves is NOT going to make you any friends. So even if you don’t care about the appearance of your lawn, your neighbors will hate you if “your” leaves blow onto their lawns. So raking = happy grass and happy neighbors. 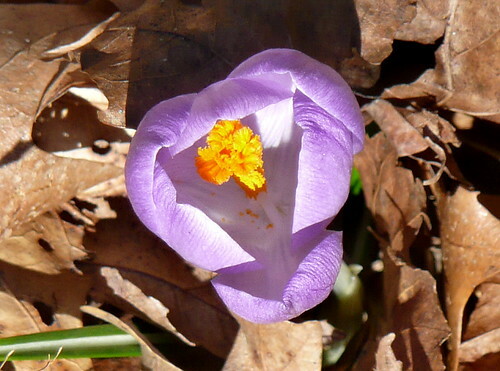 Good luck crocus-hunting, Leslee. 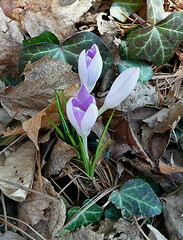 I think this particular spot is home to early bloomers as I haven’t seen any crocuses anywhere else yet. These are so beautiful. The first tiny flowers that appear so bravely just make you feel absolutely wonderful, don’t they. Beautiful! I love the purple.